Exciting News from CDC Park West! Being born in Charleston and coming back every summer to visit extended family, Maureen knew that after college this was where she wanted to live. 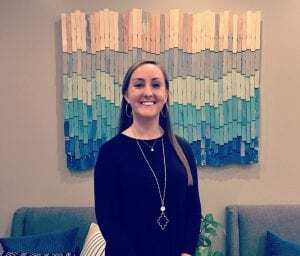 After obtaining her degree from Presbyterian College, she moved down to Charleston to gain a Master's of Education in Counselor Education through The Citadel Graduate College. While in graduate school, Maureen worked at Daniel Island Academy as a full-time teacher for two years. She then served as a school counseling intern at Marrington Middle School of the Arts in Berkeley County. This December, Maureen completed her time at The Citadel and received her school counseling certification. She has also taught Sunday school for several years and is excited to be at a center with Christian based philosophies. Maureen has lived here in Mount Pleasant for two years. She enjoys reading, seeing movies and exploring downtown Charleston to try out all different types of restaurants with her husband who works as a chef at Wild Dunes. Maureen is excited to be a part of the CDC family and will work to maintain the center's educational practices while building strong relationships with the staff and parents.